Well, I walked out of my front door the other day, struggling with buggy (carrying coldy toddler) and dog (very excitable Jack Russell). I had, to be honest had a difficult day. Toddler and dog have a way of winding each other up, especially when said toddler has a cold so is already grumpy (seriously it’s like having two toddlers!). Finally I gave in; strapped moaning toddler into buggy; tamed the tornado of a little dog and headed, rather stressed, out of the front door and towards the park. As I was struggling to get the buggy through the front gate, a tiny splash of purple caught my eye. Just poking through the ground was a small Crocus. It’s the first Spring flower I’ve seen this year and the sight always brings joy to my heart. It means Spring is on it’s way. The short dark days will soon grow longer and brighter and the bare, cold countryside will soon be flush with beautiful flowers, leaves and wildlife. Everything will come alive again. Don’t get me wrong, I actually like Winter. I like the cold fresh mornings, the frost and the promise of snow (yes we’ve actually had snow this year!). I like wrapping up warm with cosy scarves and gloves. However by this time in the year I am looking forward to Spring and the warmer weather. Winter for me is mostly taken up with knitting projects and Christmas presents. 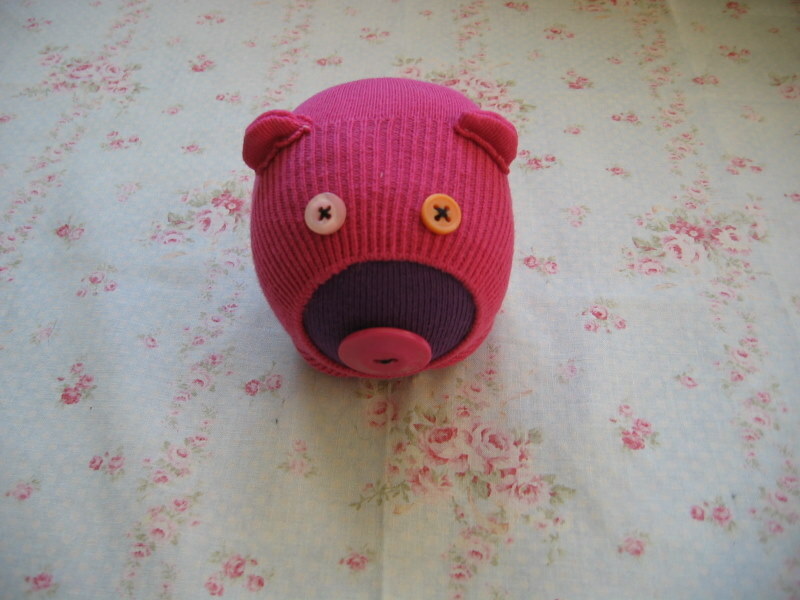 I have done a little sewing but for me, sewing is normally done when the weather gets warmer and knitted items are no longer needed. Of course I do sew during the winter, it’s just most of my projects are knitted.This year especially, has been very busy. I have had to knit myself a few new jumpers and cardigans as the ones I had are all pre baby. Also little one is now mobile and so I have less time to do things. All my projects have a very stop start nature to them (or rather pick up in the odd spare minute and then put down with the cry of ‘no not the dog!’). I have also spent the winter taking some time to work on my Folksy shop. I now have a number of items to sell, ones which I’m hoping there will be a market for and a number of exciting new designs in the pipe line (my sketch book is filling up very quickly). For sneak peaks, check out my facebook page (link on the side of my blog). With the new weather and the promise of Spring I have once again picked up my needle and tread and started sewing. 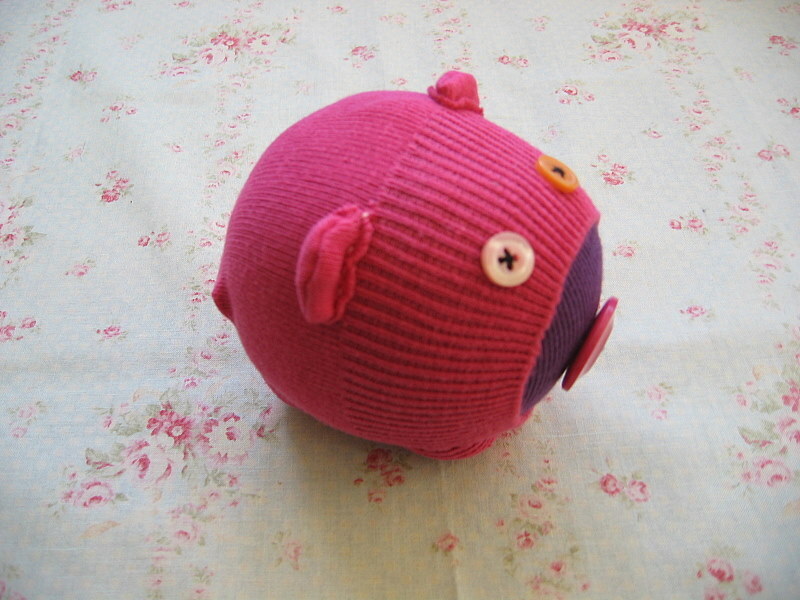 Here’s a little pig that I made from a few socks I was given for my birthday from people who obviously know me well! I think he’s quite sweet. Pigs make me think of spring. It probably sounds silly but there is a farm near us that I sometimes walk by with the dog whose pigs are shut away during the winter but come spring and summer they come out into the field. I’ve always loved pigs and every time I walk past pigs, I have to stop and admire them. This little fellow is my nod to the promise of spring.